In April of 2014, my boyfriend and I adopted Gus, or Truman at the shelter. He was only 7.9 lbs, approximately 3 years old, and was found outside with mites. We soon discovered that he was a very intelligent cat, chewing on cords just to get a reaction out of us, scratching everything that he wasn’t supposed to scratch, and extremely talkative. We decided at the beginning of June of the same year that we needed to get him a friend who ended up being Spirit, or Penelope to us. When we adopted Penelope, she was 2 years old, just over 6.5 lbs, and rescued from an abandoned home. She was extremely shy and hid from anyone and anything. They weren’t too fond of each other at first but came to be best friends, mainly through talking which they both love to do. Almost a year and a half later, Gus is now 11.5 lbs and Penelope is now 7.5 lbs. They both love to cuddle, especially with each other on top of their cat tree. We’re so grateful to have them in our lives! 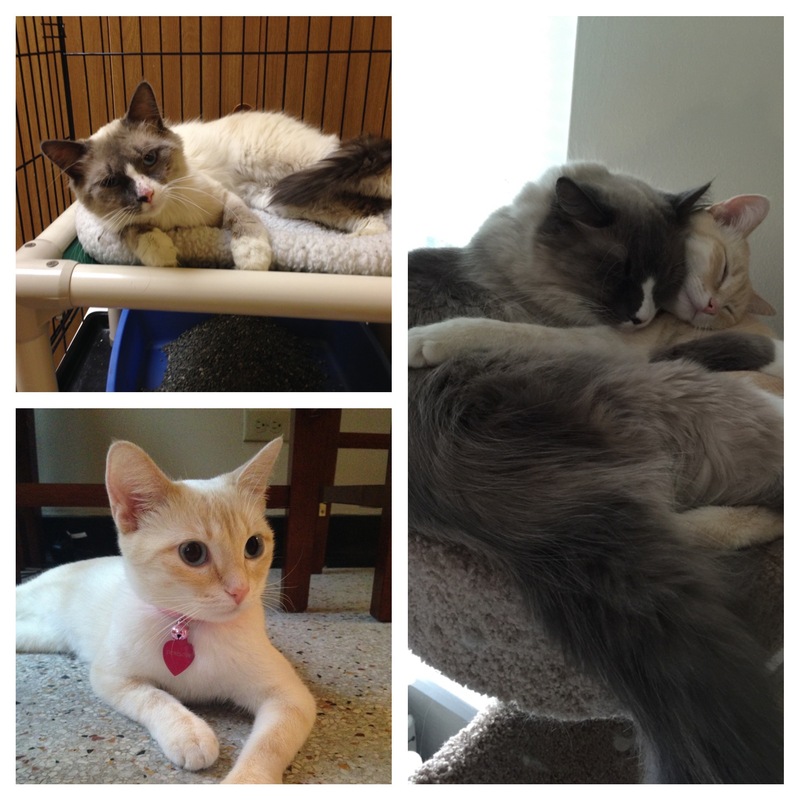 I’ve attached a picture of each of them on the day we adopted them, and of them now, cuddling in their favorite place! Previous PostRendy and RavikNext PostAlex has a family!